If you like carpets and/or prefer accent rugs over bare floors, then you know how important it is to maintain them. This is especially true if you have kids. Regular vacuuming, timely spot-cleaning and periodic washing will not only ensure your carpets are always clean but will also contribute to their longevity. Now, the question is which cleaning method to pick – steam cleaning or dry cleaning. These are both very popular methods and both have their pros and cons, but in the battle of which method is more effective, steam cleaning has the lead. Steam Cleaning – The biggest myth of steam cleaning is that steam itself cleans your carpet. Well, this is not true. Steam cleaning machines use hot water which gives off steam and thus the name steam cleaning. This method was for long known as a hot water extraction method and is mostly recommended by carpet manufacturers. It cleans stubborn stains and dirt best while at the same time it disinfects the carpet. Steam cleaning equipment has been improved over time to ensure best results in less time. Another good thing about this method is the fact you can do it on your own. All you need to do is rent needed equipment and get detergent. 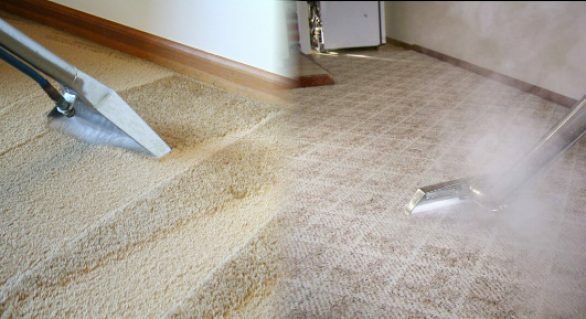 For best results, however, it is best you use services of one of many carpet cleaning Brisbane companies that have experience and trained staff to complete job in no time. However, there is a con to this method – a minimum of 2 hours drying time depending on a carpet. But it is usually recommended to wait 12-24 hours before using the carpet to make sure it is completely dry. Dry Cleaning – This method was first introduced in the 70s, mainly as a niche market against steam cleaning market. Over the years, however, equipment used for this method has not much advanced contrary to steam cleaning machines. Another con is not the most effective way of extracting dirt completely. Think of dry cleaning as a duster cleaning. Not all stains and accumulated dirt can be cleaned effectively. But, dry cleaning has its pros. It is fantastic on well-maintained carpets. It also has a very quick drying time since it uses dry solutions which are sprinkled on the carpet to break down dirt. And this is another drawback to dry carpet cleaning – these dry solutions consist of various chemicals that can be harmful. So, which is better – steam or dry cleaning. We prefer steam carpet cleaning but know there is no perfect cleaning method nor a method that will remove all stains. To ensure your carpet is clean and looking as new, regular maintenance is of utmost importance.